What is current thinking on the female diety with outstretched arms in the ancient Indus, Egyptian and Mesopotamian cultures? Above: Plano convex molded tablet showing a female deity battling two tigers and standing above an elephant. A single Indus script depicting a spoked wheel is above the head of the deity. Discovered in Harappa, 1997. The human-animal "combat" scene is indeed common to the three areas, but in Mesopotamia it is lions that are often depicted, not crocodiles. A reasonable hypothesis about this is that the areas share a common ideological substrate from deeper in prehistory, but there is no way to determine this directly without readable texts. The animals in ancient Iran, Mesopotamia and Egypt are not crocodiles but lions. In these western cultures, the image represents royal power and the eternal struggle of cosmic forces; its adoption in the Indus Civilization seems to result from the early Mature Harappan direct trade contacts with Mesopotamia. I have written a long illustrated paper on this theme presented in 2008 at a symposium in Kyoto, now in press, entitled "Motifs of early Iranian, Mesopotamian and Harappan art (and script), reflecting contacts and ideology". A contest scene is common throughout the Near East and its neighbours. In Mesopotamia and Iran, it usually involves a man (or deity) fighting two bulls or two lions, but there are also many examples of bulls fighting against lions. In the Indus, where lions existed but tigers were far more common, the lion was generally replaced by the tiger. However, in Indus iconography, tigers were usually associated with a female deity, so the male figure is sometimes replaced by a female figure in this contest scene. A number of scholars argue that the bull and lion represent binary oppositions in nature: night and day, sun and moon, heat and cold, etc. These animals have an important place in the iconography and mythology of the Near East. In the Indus they were often replaced by the tiger and the water buffalo, which continued to play an important role in later Indian mythology, for example in the contest between the goddess Durga, who rides a tiger, and the buffalo-demon Mahisasura. 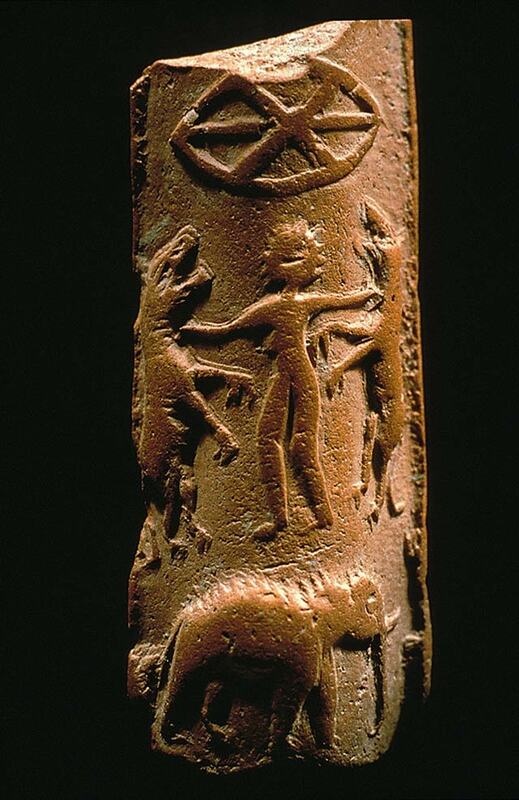 A male figure with buffalo horns and a tiger-woman shown on Harappan seals are probably deities, and buffalo horns appear regularly on pottery from much earlier times in the region, while Harappan seals also show scenes in which a buffalo is sacrificed. The shared iconography does suggest widespread shared beliefs, although probably at a relatively basic level: dangerous animals are fairly universally incorporated as symbols of power in belief systems across the globe. As far as we know, the Indus was not in contact with Ancient Egypt, but they were with Mesopotamia. I believe that in both locations people conceived of their world in different ways from which we do today. Theirs was a world in which they were very in tune with nature, observing the ways in which natural forces disrupted human events and activities. Form these experiences, they conceived of gods and goddesses responsible for these events, like gods of water, etc. In that kind of world, imagery and ritual revolved around appeasing these gods or working with them. In a book by Bruce Trigger, Comparative Early civilizations, he notes that many early cultures viewed the world and nature in this manner. I think the Mesopotamians and the Indus shared this view, both as early cultures and perhaps through their interaction, either movement of visual imagery or traders who travelled and returned with stories. My book in chapter 10 discusses this possibility. The image you suggest fits with the ideas I write about in that chapter. I think you are referring to the seals which show a man (not a woman) fighting two lions (in Babylonian seals) or two tigers in Harappan seals. The Babylonian seals are connected with the legend of Gilgamesh. It is generally considered that the Harappan motif is borrowed from Sumerian-Akkadian sources, substituting lions with tigers. My view is that the motif of man fighting beasts is very ancient and shared by many old civilisations. Joseph Campbell calls the motif ‘queller of beasts’ and traces it to many civilisations (the masks of god, primitive mythology 1960). In one of my recent papers I have drawn attention to the title ‘Pulikadimal’ in Dravidian which means tiger killing hero, which fits in as a good description of the Indus seals with this motif.